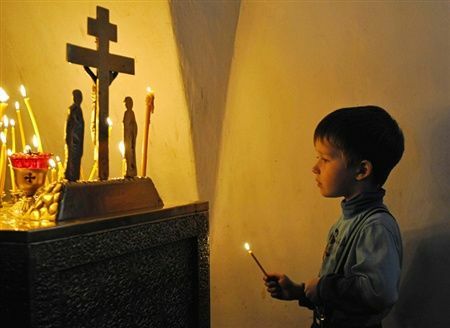 How Does Orthodox Way of Life Begin? Our deeper spiritual life begins when our soul begins to long for God and assert itself in our conscience. When this happens it leads us to change our way life. the sense that it is a soul in exile; when it realizes that it is something that has been cast away, and now exists outside of its proper place, outside of Paradise, in a foreign land, beyond the borders within which it was made to dwell. To begin to think about changing our way of life, to live according to the ten points of an Orthodox Way of Life, we must begin to acquire the feeling that we are separated from God. This is a feeling where we sense there exists some invisible barrier between us and God. Spiritual life does not begin from any kind of intellectual analysis. On the contrary such efforts may only increase the size of the barrier. The Spiritual life, you see, begins with a kind of vision, with the feeling of banishment, and this is not arrived at by means of any intellectual analysis or evaluation. I simply feel within myself the presence of a wall, a barrier, and I don’t know what’s beyond it. This is a feeling that there is an insurmountable obstacle that we must overcome, that there is a “dividing wall” (Eph2.14) between us and God. We realize how distant we are from God. We begin to understand that He is Spirit but we ourselves are only flesh. We realize that we don’t really have any conversation with God, but only talk at Him, often only out of obligation. As this feeling of separation, of being in exile, develops, we begin to seek God in earnest. First must come this feeling of being separated from God. But if the soul doesn’t have this feeling, it can’t even begin to embark upon a spiritual life. It may live a Christian life, but only in a manner of speaking, only in appearance, only on an intellectual level, only within the limits of its own conceptions. This feeling of separation provides the proper motivation to participate in divine services, personal prayer and ascetic practices voluntarily without the sense of obligation or “l must.” The soul will move us forward based on a divine vision, one where we begin to see our fallen nature and realize we belong in paradise. The beginning is not a fear of condemnation to a burning fire in hell, but a desire to be united with a loving God. This feeling of separation leads us to try to understand why we are separated and the desire to seek the help of the Holy Spirit to unite us with Him. Culture Wars: Can Christianity Change the World?